The service techs jacked up a jet-black Porsche in the bay closest to the viewing window and a young man and his father unloaded four boxes from a truck. The techs buzzed around the car and boxes like bees drawn to honey. They worked diligently, only stopping to pose for pictures with the young man and the new BBS rims. My Saturn was placed 6 bays away and sat wheel-less for nearly an hour. This kid pulled up a stool beside me at the viewing counter, watching closely as the techs place the new tires on the shiny black wheels. Never one to pass on an opportunity to meet someone famous, I introduced myself and asked about all the activity. It turned out that I was sharing the counter with none other than Carlos Daniel Linares, the Venezuelan racing hot-shot who is taking the racing world by storm! I was fascinated by his humility, despite his place on the world stage. We talked for the remaining time about racing, technology, safety, tires, diet, fitness, the Noblesville housing market and his amazing car. We posed for a picture. He gave me the thumbs up and I cried just a little. I later learned that this his trademark move and not just reserved for his Discount Tire Buddies. Eventually the techs finished with my car and brought my keys. I stood around and chatted for a short time but after a while I determined it was getting awkward because I didn’t have any other reason to wait. 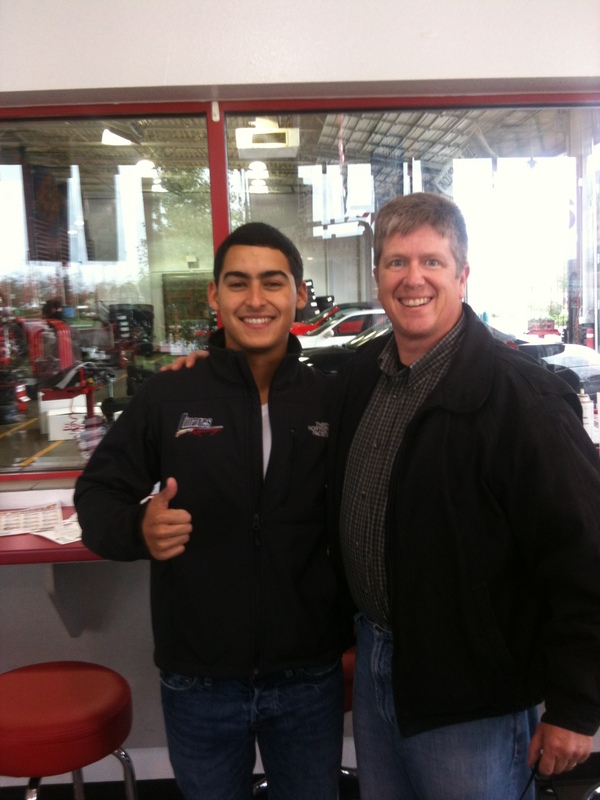 Finally, Carlos informed me that I didn’t have to wait while they finished his car. He was such a nice young man.